This is certainly a hodgepodge post coming up. First up, podcasts -- had to give up on Cast On. I had been listening to it and I found it acceptable, if not great. Then, in one of the early episodes, the podcaster starts to rant about someone who gave her podcast a negative review on their blog, stating that that person should do their own podcast and how she, the podcaster, was being brave putting herself out there. Blah. It is tough to put yourself out there. I agree. But, I feel this is the same argument authors make when they get a bad review on Amazon. They feel perfectly justified in arguing that bad review. Listen, a bad review is not the worst thing in the world to happen to you, folks. If someone hates my blog, they hate my blog. If someone hates me, they hate me. It's an opinion. Listening to another person's opinion does not make it fact. For instance, I'm giving up on Cast On because I feel the podcaster is too thin-skinned and she intersperses too much music with her podcast and her knitting content does not thrill me. Does this make her a bad podcaster? No. Does this mean you shouldn't listen to her podcast? Not unless you dislike thin-skinned podcasters, too much music, and we have the exact same knitting tastes. If this is true, don't listen to her. Otherwise, give her a try. She's popular. I might be wrong. Next up, knitting. Okay, it's boring. Again, I ordered the third skein, and I await it to complete those socks. Secondly, I'm knitting on my Slytherin Scarf again. I know! I forgot it existed too! Lastly, the exciting stuff! 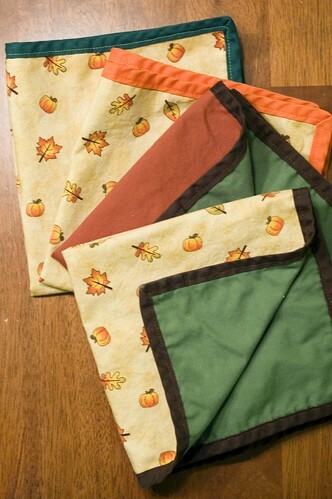 Around a week before Thanksgiving, Paul said that I should sew some nice napkins for the dinner for six people we were having. Slightly intimidated by the idea, I decided to try it. Looking around, it appeared I would need a rotary cutter, self-healing pad, ruler, a yard and a half of fabric, another yard and a half of fabric, bias tape maker, and two yards of fabric for the tape. After putting that all, plus some fabric bolts, into my cart at Joann's Fabric, I realized I had roughly one hundred dollars worth of goods for six napkins. That's ridiculous, especially considering the pure number of sales that Joann's has! I put everything back but the fabric bolts and the ruler. I went and got some tailor's chalk. Then, I asked for one and a half yards of two of the fabrics and asked for the third to be taken back. 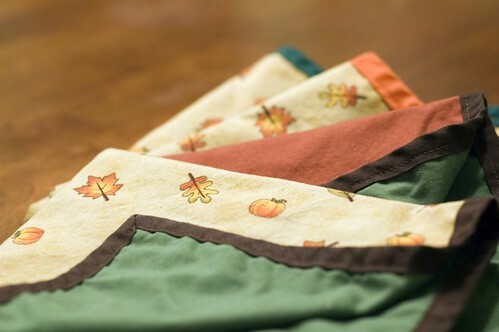 I was sadly surprised to learn that my first print choice (a set of leaves and pumpkins on a neutral background) only had one yard left, so I bought a half of a yard of my third fabric choice. After this, I went to the bias tape section and looked through the paltry selection for some matches to my fabric. I was right to do all this, because now I have a coupon for 50% off of a single item to Joann's which takes my self-healing mat from $50.00 to $25.00! A $25.00 savings for patience. I like! Anyway, I got home, and started chalking up some squares and cutting 'em out. This was hard for two of the fabrics which had enough stretch that the squares are more square like than perfectly square. The third, nearly thrown away, fabric had no stretch and was lovely. The next night, I pinned everything together and started to sew! I'm fairly happy with how things came out, and now I want to do way more of these. I want a Christmas set, a winter set, a birthday set, a Halloween set, and more! I want Easter sets, summery beach sets, spring flower sets. I love them. I also want to make them for everyone I know. Seriously, I am going to use these until I make more. And now I want all those expensive tools! WOW - They look great! I am very impressed and am wishing I knew how to sew!